From the combination of the creamiest milk and all the richness of the tasted coffee aromas that evoke notes of caramel and cereal we present this coffee of involving body. Crowned by a silky cream, the Robusta coffee blends perfectly with the creamiest milk to create a harmonious and balance cup, perfect to start your day. Making these velvety pods couldn’t be simpler. Because the rich coffee and the milk are mixed together in one pod, great tasting coffee is just moments away at the touch of a button. Also, thanks to the maximum 15-bar pump pressure in our beautifully designed coffee machines, you can expect the same quality that you’d get at a coffee shop. Crowned with creamy, silky foam, our lovely Café au Lait pod drinks don’t just taste great; they look the part too. 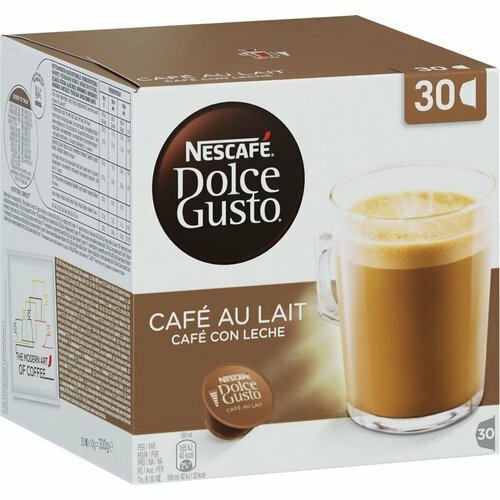 Each box contains 30 capsules designed for NESCAFÉ® Dolce Gusto® capsule machines and allows you to prepare 30 cups of Café Au Lait.